Zambeze Delta Safaris was established in 1994 in the Coutada 11 block of the Marromeu Complex in eastern Mozambique. At that time the ecology of area was ruined by the devastating legacy of the country’s civil war, during which buffalo numbers had been decimated to just over 1,000 individuals from a once huge population of over 55,000, and only 44 sable were found in the entire area. A massive and on-going effort and financial investment in staff, local communities and the ecosystem has been key in turning the tide and reestablishing a productive environment. Today the buffalo are pushing 30,000 head, and the sable population has rebounded to over 4,000 individuals. 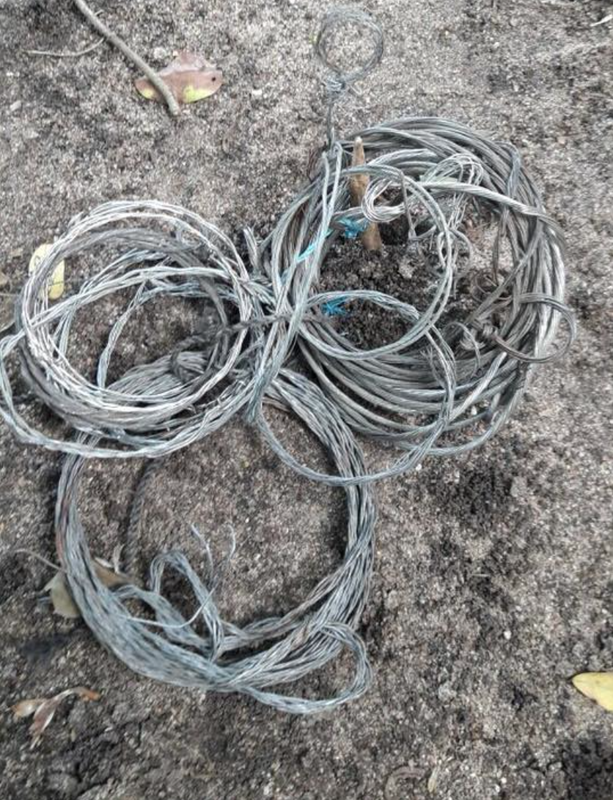 Snares, gin traps and the tools of a blacksmith who makes animal traps for a living. 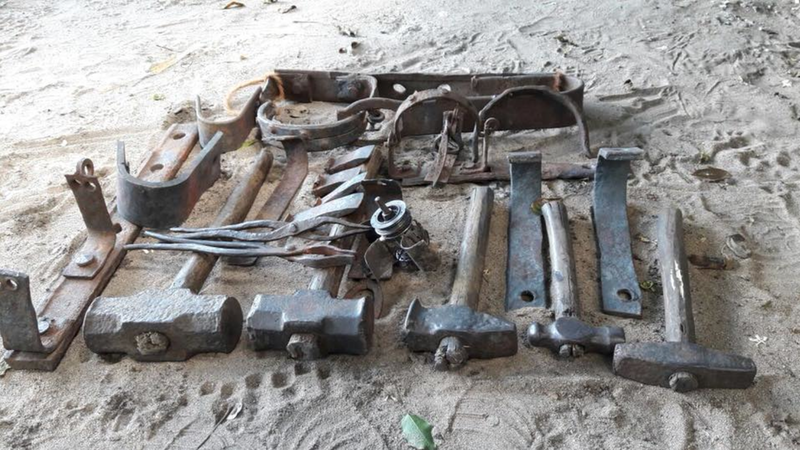 All of these seized by anti poaching efforts. But as the wildlife populations grow, so too does the incentive for poaching. The Zambeze Delta Safaris Anti-Poaching Unit originally consisted of 5 local villagers (2 of whom were trained in Gorongosa National Park); but has today matured into a serious force, with over a dozen motorbikes and a Land Cruiser and helicopter – and the personnel have developed into a very strong team that is skilled at adapting to and reducing the ever evolving poaching threat. The Zambeze Delta anti poaching team. Many years ago we were proud of the 4 men and their achievements - pictured here with some gin traps they have removed. However, anti-poaching deals with the symptom, not the cause, and is therefore only part of the solution – though no doubt a very important part. The other part of the success has been secured in forging and enhancing positive relationships with the local communities. Meat harvested from the safari hunting operations is distributed between the villagers and camp staff, and a mobile milling unit regularly services each settlement. Additionally, a school and clinic have been built on site and are freely accessible to the local community. The global challenge facing wildlife conservation is obviously in protecting ever-shrinking areas for the habitats and wildlife therein, whilst also integrating the ever-growing local communities as part of the process and solution – the end goal being the development of custodians of the wildlife as opposed to incentivising agents for the black- market trade. The overall success or failure of conservation efforts can be measured against the level, or lack, of local support; and therefore enhancing the local communities must be a fundamental part of any modern conservation mandate. The hunting-led conservation model in Mozambique is a fantastic example of a positive feed-back loop – the more the wildlife population recovers, the higher the hunting quota; the higher the revenues generated, the more funding is available for anti-poaching and community support (and the more support from the community, the more they directly benefit); the more protection, the more secure the long-term conservation status of the wildlife. Wildlife populations in the Zambezi Delta have recovered to the point that is now appropriate to implement the next phase of the ecological restoration: carnivores. As a function of their position at the top of the food chain, predators regulate the entire trophic system and are thus a critical cog in the ecological machine. Lions were historically present and common in the Zambezi Delta, and vagrants are occasionally still encountered on the boundaries; but the abundant lion population of old has not recovered to historical levels. Why did the lions not return? Is the current environment ecologically suitable for lions? Today, a short flight over the delta will reveal just what a remarkable recovery we have seen. Enormous numbers and all as a result of this fearsome investment.